Wyoming Whiskey Single Barrel Bourbon (44.0%): Well, to begin with I have to admit that Mark Gillespie of WhiskyCast fame is the sole reason why I ordered this bottle all the way from Wyoming... I actually remember him talking about Wyoming Whiskey way before but a few weeks earlier he really got my attention with his remarks about their new Barrel Strength release. 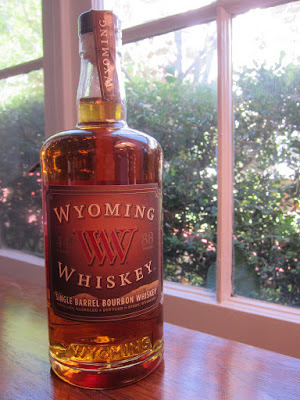 The whiskey on my desk now is not that particular bottle he was raving about nor a rare one but a single barrel bottling nevertheless I ended up ordering online from Bottled Wyoming. The distillery is located in Kirby, Wyoming and the bottle I am about to taste is filled from barrel number 841 on September 1st, 2015. Color: Polished copper, orange blossom honey. Nose: Subtle and soft. Sour cherry jam, cinnamon dusting and baklava syrup prepared with lemon and honey. Rosemary and dried pine cones, lemon vanilla pound cake. Walking into a carpenter's shop: plane shavings, smell of burnt wood in the air, tung oil and butchers wax. Palate: Very similar to the nose but a little more herbal: Thick honey, Greek baklava, candied almonds and orange zest marmalade. Barrel aged gin, fennel seeds and corn bread. Old school cream soda, mead brandy and heavily toasted oak staves. Finish: Quite long with a fizzy feeling at both sides of the tongue: White pepper, ground clove and cinnamon. Overall: It is a complex, well matured and tasty bourbon. Smooth, sweet and I have to say it is way too easy to drink. One can clearly see the master distiller Steve Nally's three decades of Maker's Mark experience in this whiskey combined with limitless freedom he must be enjoying very much without worrying about the brand's heritage. Thanks to Mark for encouraging me to get this bottle, I surely will enjoy every drop of it.